If you enjoy concentrates and cartridge vapes, the Linx Hypnos Zero is your new best friend. The Hypnos Zero looks just like your standard vape pen for cartridges, except it has a completely different construction. 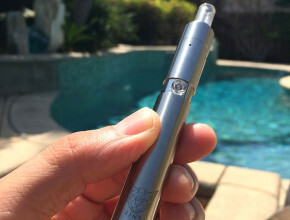 This vape pen is specifically engineered for use with extracted cannabis concentrates like crumble and shatter. This tiny, compact pen is an excellent vape option as it performs flawlessly and is reasonably priced. The Hypnos Zero is literally a god send (‘Hypnos’ is the Greek god of sleep) for true vape pen and concentrate lovers. We had a chance to meet the friendly folks from Linx Vapes over at the Champs trade show in Vegas this summer. We were intrigued by the simplicity and clean design of the pen. After spending a whole weekend with this baby at another trip in Vegas, we can honestly say this is one of our favorite vape pens so far. It’s now coming with us everywhere! For vaping concentrates, you have several options: desktop vapes, portable combo vapes like the DryHerb+ from Blackout X, or dab rigs like the Dabado Bolt. 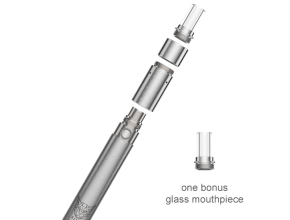 The Hypnos allows for precise concentrate vaping as it uses a push-button battery with variable temperature settings – take properly controlled pulls every time. The Hypnos Zero is a design marvel. The construction is so simple with its stainless steel body and all ceramic heating chamber. Another detail you will notice is the cross-drilled air holes carved into the chamber, just above the base of the ceramic heating plate. The placement of these holes above the concentrate prevents residual product from clogging or dripping out and causing a mess. With the Hypnos Zero, you will always get smooth, consistent hits – so be sure to use high quality concentrates. This is a wickless vaporizer that produces the perfect level of conduction heating. With it’s 4-temperature settings (each heat is indicated by a different color light), you can decide which amount of heat works best with your particular type of concentrate. The Hypnos vape pen breaks down into several interchangeable pieces for easy maintenance. 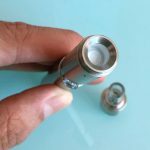 The mouthpiece is comprised of a glass tip that screws into a separate filter which connects to the chamber/atomizer. Dab rigs are nice and all, but there’s a learning curve to dabbing and it requires lots of accessory products. The Hypnos is a rather simple plug-and-play vape. 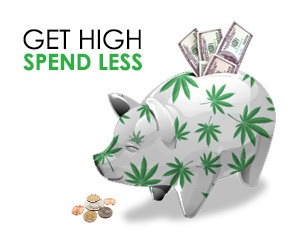 Simply drop your concentrates in the heating chamber and hold down the button while you take a puff or two. We tested out the Hypnos vape with some Blue Dream (Sativa) Elve’s Bread Crumble from Waxman and some Sour Diesel crumble. First we tried the Sour Diesel crumble and were blown away with the surprising flavor and full high effects that this vape was able to deliver. We also tried using just the battery with some vape cartridges which worked well (compatible with 510 threaded cartridges). 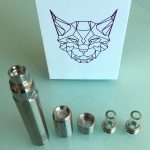 Overall great vape – the only thing it’s missing is a dab tool for loading concentrates into the chamber! Atomizer: All ceramic heating chamber and ceramic plate. Heating element: Ceramic plate heats instantly and evenly. Material: Vapor path is constructed entirely from medical grade components. The Linx Hypnos Zero is available for $77.99 with FREE shipping through VapeWorld. Linx Vapors offers other versions of the Hypnos. Go check them out and follow them on Instagram @linxvapor. 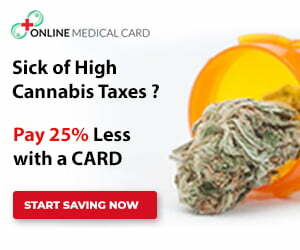 Need some cannabis concentrates to use with the Hypnos Zero? If you’re in California, find local delivery in your city with the Eaze and Nugg delivery networks.